Background: Evaluating and monitoring the performance of emergency departments (EDs) are steps in one of the most important processes to improving the efficiency of hospitals. Indicators such as patient wait time until being visited by a doctor, patient wait time from the order until admission, percentage of patients with a determined order, time of conversion of a patient’s condition, time of physical exit of discharged patients from ED, percentage of discharge with personal responsibility, and percentage of unsuccessful cardiopulmonary resuscitation (CPR) have been used for this measurement. Objective: The current study compared performance indicators in Baqiyatallah Hospital from December 2011 to June 2015. Methods: For this cross-sectional, retrospective study, the study population contained completed checklists of performance indicators in Baqiyatallah Hospital’s ED from December 2011 to June 2015. Five indicators were selected and analyzed using SPSS software and χ2 and analysis of variance (ANOVA) tests. Results: The mean ED performance indicators showed that 71.72% ± 13.29 of patients were determined within 6 hours, 57.53% ± 27.54 were discharged within 12 hours of ED admission, 63.36% ± 12.74 had unsuccessful CPR, 4.57% ± 0.84 left the ED with personal responsibility, mean duration of triage level 1 was 1 minute ± 0.55, mean duration of triage level 2 was 2.83 minutes ± 0.48, mean duration of triage level 3 was 8.58 ± 13.09 minutes, mean duration of triage level 4 was 19.24 minutes ± 13.24, and mean duration of triage level 5 was 40.53 minutes ± 11.66. Statistical analysis of the results showed significant differences in all indicators. Conclusion: The general performance of the Baqiyatallah Hospital ED was estimated to be favorable, and the general process of change during the study was positive compared to previous years; however, the level and quality of services can be increased through some proposed means. Jafari Joneydi N, Sadeghi M, Izadi M, Ranjbar R. Comparison of performance indicators a hospital in Tehran with national standards. Journal of Military Medicine. 2011;12(4):223-228. Slade D, Manidis M, McGregor J, et al. Communicating in hospital emergency departments. Berlin Heidelberg: Springer; 2015. doi:10.1007/978-3-662-46021-4. Wakai A, O’Sullivan R, Staunton P, Walsh C, Hickey F, Plunkett PK. Development of key performance indicators for emergency departments in Ireland using an electronic modified-Delphi consensus approach. European Journal of Emergency Medicine. 2013;20(2):109-14. doi:10.1097/MEJ.0b013e328351e5d8. Murphy A, Wakai A, Walsh C, Cummins F, O’sullivan R. Development of key performance indicators for prehospital emergency care. Emerg Med J. 2016;33(4):286-292. doi:10.1136/emermed-2015-204793. Parmenter D. Key Performance Indicators: Developing, Implementing, and Using Winning KPIs. John Wiley & Sons; 2015. Welch S, Augustine J, Camargo CA, Reese C. Emergency department performance measures and benchmarking summit. Acad Emerg Med. 2006;13(10):1074-1080. Maleki A, Sajjadi M, Rezaei Khabushan B. Explanation and improvement performance indicators of the emergency system using discrete event simulation (case study: Arak Imam Khomeini (Persian). Journal of Health Information Managment. 2014;11(1):4-16. Madsen M, Kiuru S, Castrèn M, Kurland L. The level of evidence for emergency department performance indicators: systematic review. Eur J Emerg Med. 2015;22(5):298-305. doi:10.1097/MEJ.0000000000000279. Baratloo A, Rahmati F, Foruzanfar M, Hashemi B, Motamedi M, Safari S. Evaluation of emergency department activity. Iran J Emerg Med. 2015;2(1):33-8. Asadi P, Kasmayi VM, Ziaziabari SM, Marzbani BB. Status determination Poursina hospital emergency department patients before and after the implementation of emergency medicine specialists. Iran J Emerg Med. 2014;1(1):28-33. Combs S, Chapman R, Bushby A. Evaluation of fast track. Accid Emerg Nurs. 2007;15(1):40-7. Hashemi B, Baratloo A, Forouzafar MM, Motamedi M, Tarkhorani M. Patient satisfaction before and after executing health sector evolution plan. Iran J Emerg Med. 2015;2(3):127-133. Alizadeh M, Movahed M, Sadroldini S, Mostafavi A, Fathi M. The evaluation of resuscitation results and the factors influencing it in the Baharloo hospital (Persian). Tehran Univ Med J. 2016;74(9):640-644. Sanchez M, Smally AJ, Grant RJ, Jacobs LM. Effects of a fast-track area on emergency department performance. J Emerg Med. 2006;31(1):117-20. doi:10.1016/j.jemermed.2005.08.019. Medeiros DJ, Swenson E, DeFlitch C, editors. Improving patient flow in a hospital emergency department. Proceedings of the 40th Conference on Winter Simulation; 2008. Hing E, Bhuiya FA. Wait Time for Treatment in Hospital Emergency Departments, 2009. US Department of Health and Human Services, Centers for Disease Control and Prevention, National Center for Health Statistics; 2012. 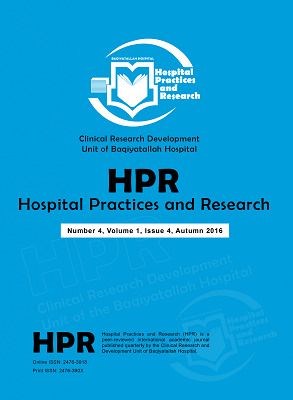 Bahadori MK, Mirhashemi SE, Panahi FA, Sh T, Zaboli R, Rezaee M. Structure, process and practices of the emergency unit of hospitals of Baqiyatallah University of Medical Sciences. J Mil Med. 2008;9(4):257-263. Nielsen LM, Kirkegaard H, Østergaard LG, Bovbjerg K, Breinholt K, Maribo T. Comparison of self-reported and performance-based measures of functional ability in elderly patients in an emergency department: implications for selection of clinical outcome measures. BMC Geriatr. 2016;16(1):199. doi:10.1186/s12877-016-0376-1. Sørup CM, Jacobsen P, Forberg JL. Evaluation of emergency department performance–a systematic review on recommended performance and quality-in-care measures. Scand J Trauma Resusc Emerg Med. 2013;21:62. doi:10.1186/1757-7241-21-62. Baratloo A, Rahmati F, Forouzanfar MM, Hashemi B, Motamedi M, Safari S. Evaluation of performance indexes of emergency department. Iran J Emerg Med. 2015;2(1):33-38.